Dr Haile is currently serving as a Country Director of the World Food Programme in Egypt. Before moving to Egypt, Dr Haile has occupied diverse professional posts ranging from a university lecturer in Ethiopia, Research Scientist in the UK, government civil servant in Ethiopia, international private sector consultant in IGAD and most recently the UN WFP. Since joining WFP, Dr Haile has worked in the Sudan leading a food security and early warning system development, then he moved to the Head Quarters of the organization in Rome, Italy to lead the GIS and remote sensing section of WFP with a global responsibility, then he was appointed as Senior Policy Advisor of the Deputy Executive Director of Hunger Solutions and more recently Deputy Director of the WFP Africa office in Addis Ababa, Ethiopia, with main responsibility liaising with the African Union, NEPAD and ECA. 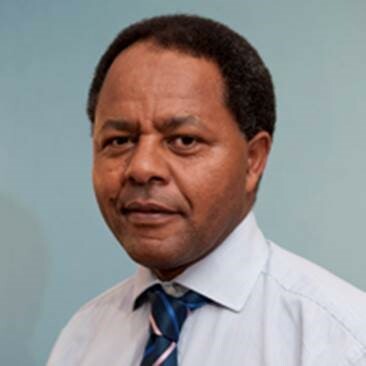 Dr Haile has a PhD in Meteorology from the University of Reading, UK and has published several papers and he is regularly invited to speak at international conferences in the area of food security monitoring, climate change and technological applications. Dr Haile’s professional interest revolves around capacity building of national governments and developing strategic partnerships with the AUC, NEPAD and Regional Economic, Communities (RECs) in the areas of early warning and Vulnerability Assessment and Mapping (VAM), Disaster reduction and Risk Management including (such as the innovative Africa Risk Capacity – ARC), emergency response, and applications of GIS and remote sensing. Dr Haile strongly believes and advocates for African integration and building strong partnerships among African institutions and countries. He is also an internationally recognized coordinator and technical facilitator.